It’s like watching The Twilight Zone – four episodes exploring the human connection with the unknown and the unexpected and how we cope with what we will never know. Each piece is a rest stop along a galactic highway of past and future. This is what you can expect when sitting down to experience Uncharted Zones by Monkeyman Productions. 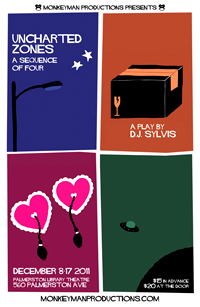 Directed by Martin Chodorek, written by D. J. Sylvis, and featuring the performances of Martha Girvin, Jennifer Kenneally, Michael Mackinnon, Amanda Ives, and Leeman Kessler as The Tour Guide, these four mini plays provoke the audience to ponder life in ways many have not considered. Chance introduces the audience to Julam and Ver, a two-person crew on a small scout ship exploring the depths of time and deep space surveying and cataloguing planets in the farthest reaches of the galaxy. In their seemingly endless time together, they reflect on their past, their choices and all that they left behind. Stars Shone on Toronto takes place in 2020 and explores the lives Shivonne and Rand during a weekly city-wide blackout. Both take the moment, standing on Shivonne’s balcony staring at the stars, to realize that in order to see things clearly, one needs to turn out the lights. Something About Smoke and the Way it Rises explores the pull-apart between two students, Alithea and Gary.Gary can’t wait to start his life together with his beloved but Alithea has other plans, plans that involve drifting apart and drifting in ways never imagined before. Last Train involves two burlesque dancers, Blanche and Alicia, both having just finished their performance for the night. While Blanche drums up ideas for future shows, Alicia’s ready to call lights out for good. Using the infinite wisdom that can only be gained from that TV band, The Monkees, Blanche offers her words of wisdom. Eerie, thought-provoking and intimate, these four mini plays involve dialogue that connect well with the audience and draws the crowd in. We become captivated by the lives of the characters and the connections they make. I became particularly enthralled with Something About Smoke and the Way it Rises, in particular the situation with Alithea (Amanda Ives) and her fascination with thermodynamics as a way of exploring her own disconnect with her physical life, her parents andRand. Her ultimate catharsis and revelation through her research turning herself into smoke was incredibly well played and directed with the use of light and sound. Another stand out performance came from Leeman Kessler as he introduced each performance, captivating the audience with the tease of the story to come and acutely reminding us of Rod Sterling’s distinctive introductions. I like how he also integrated the roar of the Bloor subway underneath as the sound of reality coming apart before us. For a show that’s slightly macabre, a little more eerie, and one that will get your brain cranking, take the time to see Uncharted Zones. – Performances run December 8-10 and 16-17 beginning at 7:30 pm. – Tickets are $15 in advance online or $20 at the door.